haned weekly by the Export Promotion Division. Foreign Agricultural Service. U.S. Department of Agriculture. Promotion Division. FAS. 1202) 447-7103. Jack Clark, Sudfish, 11, Rue Francois Appert, 62200 Boulogne Sur Mer, France. each. Type: Cranberry & Great Northern beans & Laird, regular lentils. foliage plants one to three years old, potted in peat moss. Delivery ASAP. Phytosanitary Certificate by Saudi Consulate. Customer requests catalogs. Organization, P.O Box 1362, Taif, Saudi Arabia. TELEX: 451012 PLCXP SJ. 4,000 long tons (72% extr. rate) for biscuits and 1,000 long tons (72% extr. interested U.S. supplier. Bank ref: National Bank of Greece, Thessaloniki. of 15-20 tons one container load per shipment. Total of 50 tons per year. Westminster Bank Ltd., 93 Fenchurch Street, London EC3. CONTACT: P. H.
Pudahuel Airport, Santiago. Bank ref: Citibank, Ahumada 40, Santiago. Seeds (Venezuela). Wants Daichondra lawn seed, 100 lb, best available. September 1983 delivery. Phytosanitary certificate from country of origin. 1984, first cut, 2nd cut, defibratet, milled run any seaworthy packaging. Poultry & Hatching Units, 123, Vas. Georgiou St., Megara, Attiki, Greece. Lentils (Greece). Wants lentils, 50 mt, high grades USDA standardized. required. Quotations CIF Thessaloniki. Bank ref: National Bank of Greece. determined during negotiations. Greek agent seeks also to represent a U.S.
National Bank of Greece, Thessaloniki. CONTACT: Chris Demitriadis, C.
Pickled peppers (Canada). Wants pickled peppers, sport and others. Concord, Ontario L4K 2A4, Canada. TELEX: 06964597 ANSWR BACK: UNICO TOP. smoked Salmon, pre-sliced; 3 mt small shrimp & raw prawns annually, 16-2? Athens, Greece. TELEX: 219454 GFSK GR. Phone: (01) 8947921. (01) 8947941. S.A., Feldstr. 54, 4000 Duesseldorf 30, Germany. TELEX: 8588744 STEX D.
grade. Delivery three months. GOC Health Requirements. Quote FOB U.S.
Ordonez, Barrio F1 Polo, Diagonal 84 No. 22-39, Bogota, Colombia, S.A.
Taichung, Taiwan. TELEX: 56229 JC LIN or 51163 SJUNG. Phone: (042)224568. Enterprises, P.O. Box 5443, Durban 4000, South Africa. TELEX: 624001 SA. container), OECD basic, white tag, in burlap bags with polyliner of 50 kg. regulations notified under this heading could cause a trade problem. TBT Notification Number in their communication. in apples. The objective and rationale for the proposal were not stated. Final date for comments is September 21, 1983.
of the term "natural" to describe certain foods or their ingredients. closer alinement with EC regulations. participation in this show is September 15, 1983.
telephone (6121) 52 40 71, telex: 4 186 518.
domestic suppliers or foreign importers. West German buyers are already requesting that products meet the new laws. check for $ made payable to the USDA/FAS. 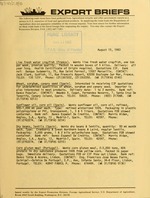 included a listing of several divisions of the Foreign Agricultural Service. contact the appropriate division in International Trade Policy.